Santorini has a large amount of restaurants, most of which offer Greek traditional dishes, made with fresh local products. For travelers who do not want to try the Greek cuisine, there are plenty of other Santorini restaurants with Mediterranean and International cuisine, or even Ethnic venues for sushi lovers. 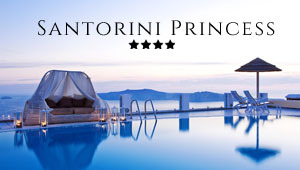 In fact, Santorini restaurants range in type, from Greek traditional taverns to upscale gourmet venues. Most beautiful restaurants in Santorini are located along the paved streets of the caldera villages, such as Fira, Oia, Imerovigli and Firostefani, offering amazing view to the volcano and the sea. Particularly great is to enjoy a dinner at the sunset time, while the burning sun dips in the sea. There are also many fish taverns that line up the beaches of Santorini, such as Kamari, Perissa and Perivolos. Here are some nice restaurants in Santorini. Each restaurant is presented with detailed text, photos and point on Google map. If you have visited any of these restaurants, feel free to write your review. All request forms go directly to the restaurant manager so that you can make a reservation in person or ask them any question. Opened in 2005 and located on the famous Black Beach of Kamari Santorini, Poseidon is a family-run restaurant that caters to people who choose Kamari as their place of stay when they holiday in Santorini. Located next to the main church of Fira with a magnificent view of the caldera, Restaurant Ampelos has a closed dining hall as well as an open terrace surrounded by a profusion of bougainvillea, geraniums and hibiscus. Our fine Mediterranean and Modern Greek Cuisine will also please your senses. A menu carefully balanced with seafood, Mediterranean meat dishes, traditional vegetarian specialties, pastas and salads - plus Ambrosia desserts. Agro in Fira is located close to the donkeys' station and the cable car. The restaurant is a nice two-storied building and affords spectacular views of the caldera, the sea and the sunset. The Blue Note Restaurant is located in Imerovigli, one of the most idyllic and highest points in Santorini with its black beaches, steep cliff sides and one of the most fabulous views of the Aegean and the caldera. Classico Cafe-Restaurant is located in the heart of Fira on the edge of the caldera and enjoys breathtaking views of the boundless blue of the Aegean and the caldera. dances with a touch of a modern style and enjoy plenty of our food in an unforgettable evening with live orchestra and dancers! Ellis Restaurant is located in Fira and has two dining areas on two levels. The dining area on the terrace overhangs the caldera and offers a fabulous dining experience. The extensive menu is centered on traditional Greek and Mediterranean cuisine. Fanari Restaurant, located on a cliff side overlooking the sea boasts some splendid views of Santorini caldera and the sunset. The menu includes original Greek specialties prepared from locally available ingredients.